Like most people you’ve undoubtedly snapped numerous photos of the joyous times that your family has spent together. Some of those photos may be of vacations, others may be of special events, and yet others may simply be candid shots snapped on the spur of the moment. The easiest way to compile all those happy family photos into a memorable slideshow is with the help of Movavi Slideshow Creator. As should be evident from its name, it is a specialized slideshow video maker that will help you to not only create your slideshow but also make it look good. To get started the first thing that you will want to do is go over all the family photos that are in your collection and select the best ones to include in the slideshow. With Movavi Slideshow Creator you can also add videos to your slideshow too – so you may want to consider inserting some short clips. Cut the slideshow into parts and remove unwanted segments. Rotate and crop photos to keep them uniform. Enhance photos with a single click to improve their quality. Place stylish animated transitions between photos to add an artistic touch to the slideshow. Add audio tracks to insert background music from any audio files. Part of the beauty of creating a slideshow with Movavi Slideshow Creator is that when you’re done you can save it in practically any video format that you want to. Having your slideshow saved as a video will make it more widely compatible, and with the help of the presets that are included in the software you can also optimize it for any device or platform. 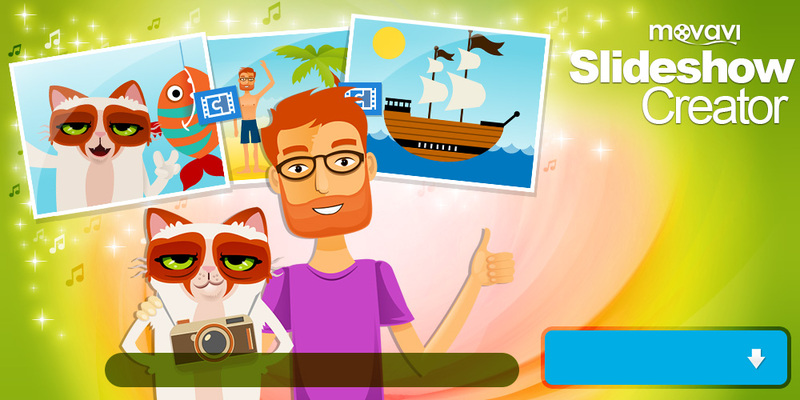 Simply put, using Movavi Slideshow Creator will let you quickly create a slideshow out of your happy family photos – and then let you improve its style and overall appearance. By the time you’re finished, it will be all set for you to share it with your family and friends, upload it to social media, or even publish it on video sharing platforms.